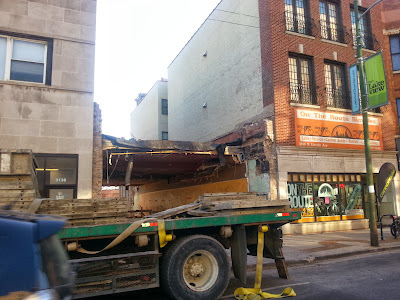 I was showing a foreclosure two-flat in "West Andersonville" and swung by this construction site. 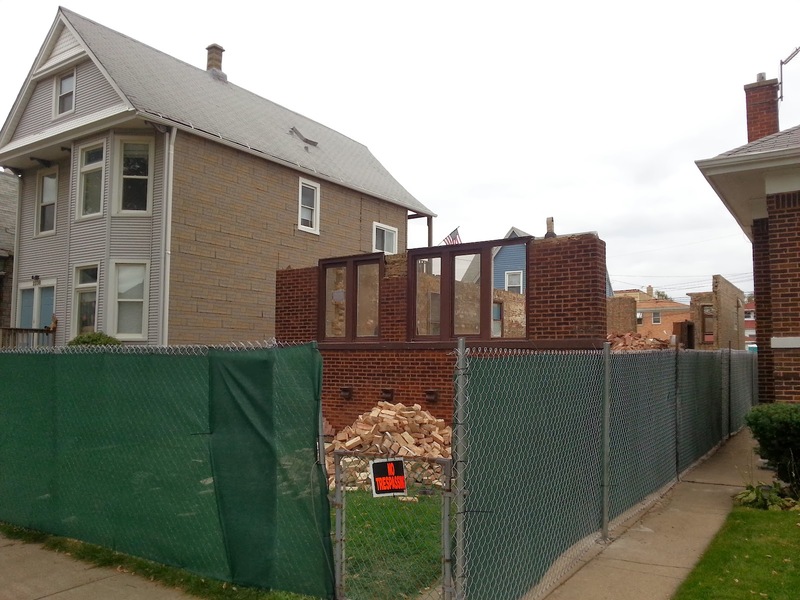 Demolition is almost complete on two frame homes sold early this year in the Bowmanville neighborhood of Lincoln Square. The side by side properties were sold to the same developer at 1830 W Farragut for $190,000 and 1834 W Farragut for $230,000. 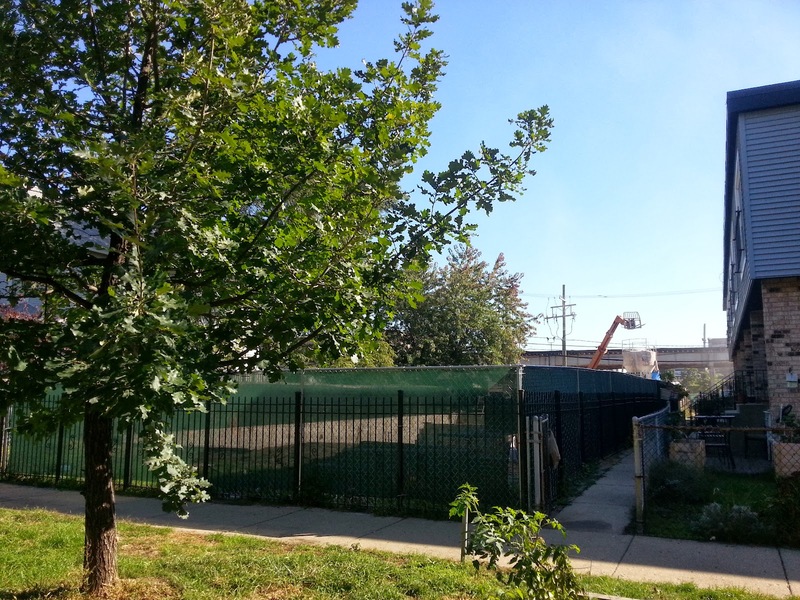 The properties at 1830 and 1834 W Farragut have been torn down to make way for new construction. 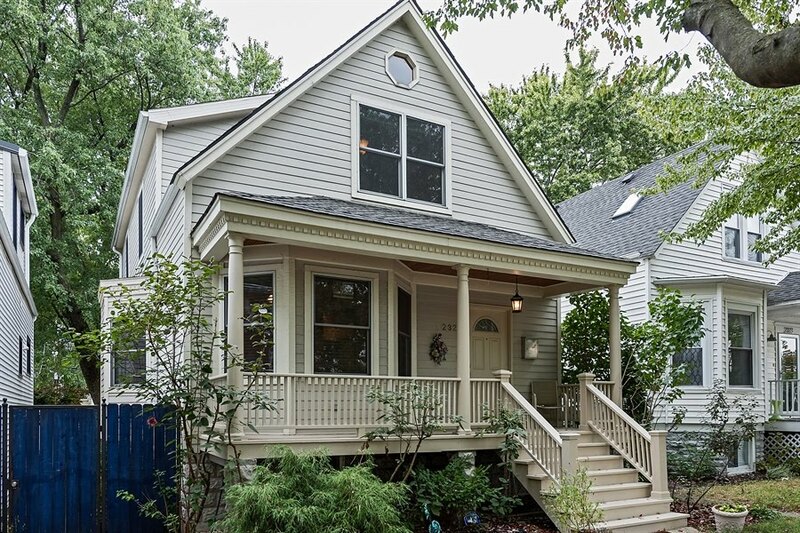 West Farragut from North Ravenswood to North Western has seen at least 5 new construction houses completed this year. The two lots are located on a cul du sac of West Farragut. 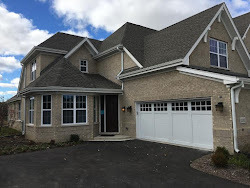 A tremendous new custom home was recently completed across the street on the southeast corner. Click here for the view of the lot prior to the construction. 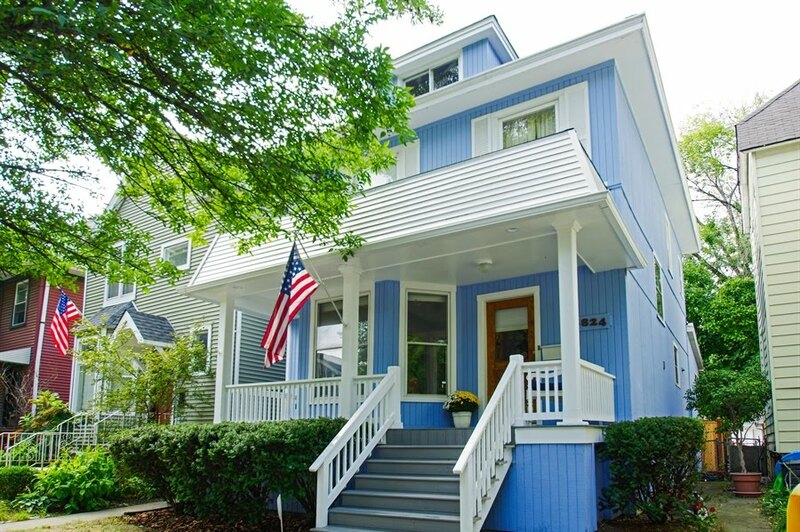 This gorgeous house above sits on the northwest corner of Farragut and Wolcott. 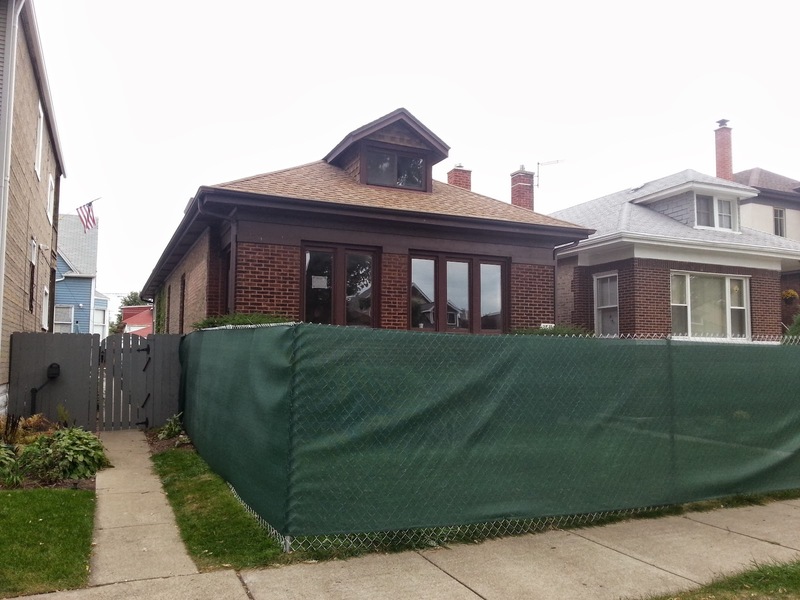 Currently, 1827 W Farragut on the block is under contract with a $495,000 asking price. It's a re-sale of an "okay" renovated house with three bedrooms, 3 baths, a standard 25 x 125 lot and a bit of a quirky layout. 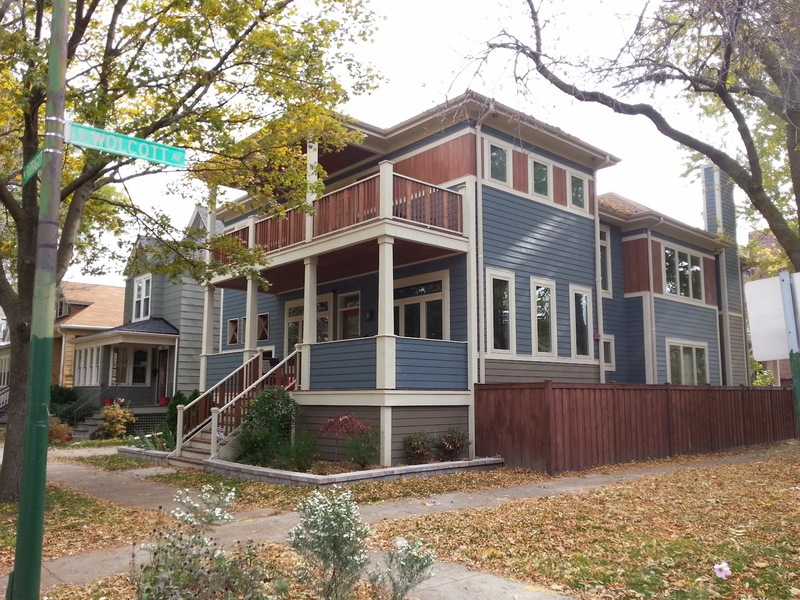 There is a permit for a new construction house at 1830 W Farragut. 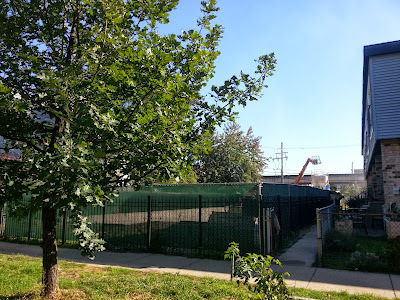 There is only a permit for tear- down for the 1834 W Farragut property from what I can see. Sooooo, this will probably be a large single family house built on the double lot. It's no secret that the Ravenswood area has been a hot place for new construction and development. 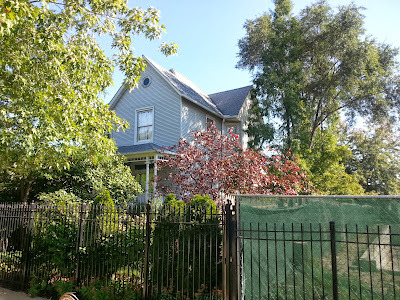 Many new construction houses and renovations have sold this past year from $850,000 to $1,200,000 within a few blocks of Winnemac Park. Several private new construction homes have been built as well. 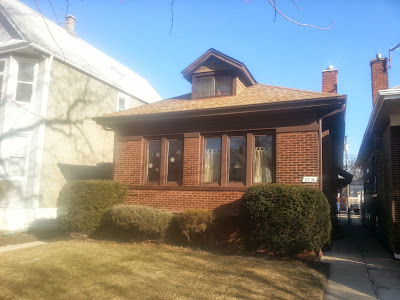 The original house at 2236 W Carmen. We represented the sale of the property in spring of 2013. 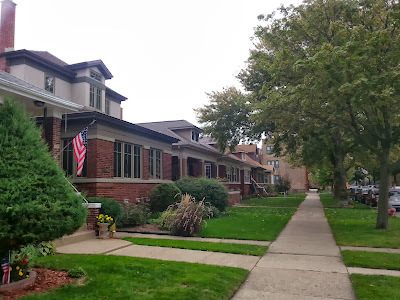 However, it's been rare to see new houses built on the "bungalow belt" of 2200-2300 blocks of West Winnemac, West Carmen and West Winona of Ravenswood adjacent to Winnemac Park. In my estimation (walking up and down each block) only two new construction houses total have been built on these three blocks. One at 2218 W Winona in 2008 and one at 2251 W Winnemac at the end of 2012. That's a pretty rare feat considering the housing boom on the North Side of Chicago. There are a handful of frame homes, two flats and three flats on the ends of the blocks. These too have remained original with little large scale renovation (although there are many updated homes, few with large scale structural changes). The permits I've located for 2236 W Carmen online show this as a "Renovation/Alteration" with estimated cost of "80,000". I have not located anything else under the address indicating a tear down. 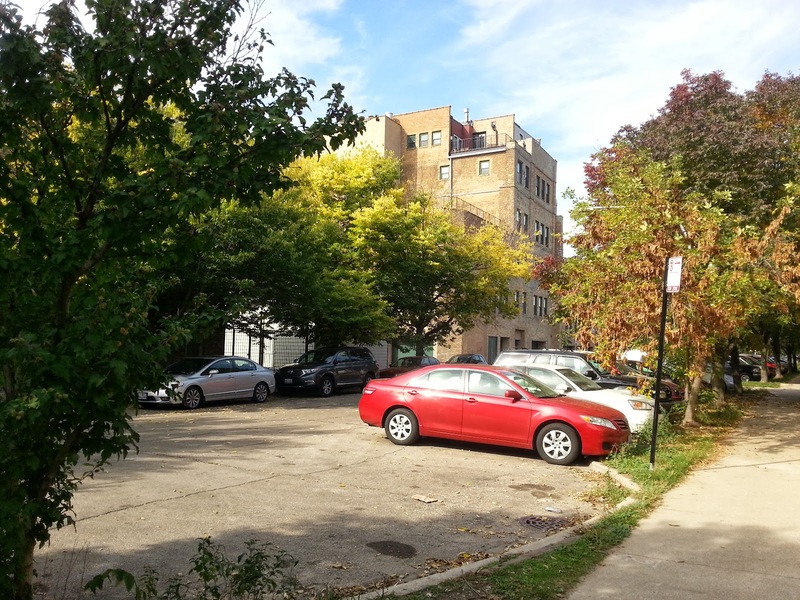 The wide 30' foot lot and location near Winnemac Park have made 2236 W Carmen very attractive for development. It remains to be seen if we'll see more bungalows and houses on these blocks re-developed as the neighborhood grows along with greater Lincoln Square. 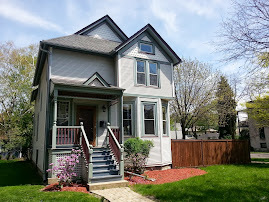 I've been looking at two and three flats for a couple of clients in the Edgewater Community Area. Let's take a look at the multi-unit sales numbers (two to four flats) this year and in years past. 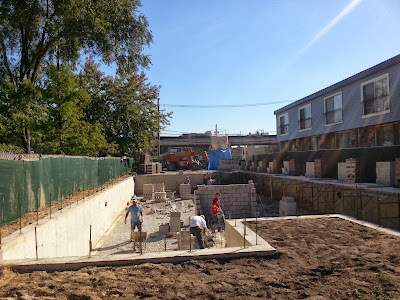 46 multi-units (two to four flats) sold in the Edgewater Community Area this year. That's up 35% over 34 sold over the same period in 2012. The median price is a hefty $510,000, up over the $447,000 median of last year. The highest multi-unit sale is 5511 N Wayne for $850,000 in the Lakewood-Balmoral community. The gorgeous 1928 custom build two-flat is on a 37.5' wide lot. The lowest sale is 1501 W Highland for $204,750. 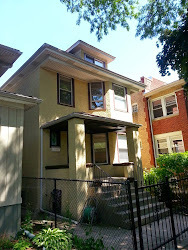 The frame building was listed as a 3 flat (with a top floor one bedroom unit) and sold as a foreclosure. I took a quick shot of rare new construction on the the commercial stretch of North Lincoln Avenue between West Belmont and West Wellington. This section has had its ups and downs. Several retail and business staples have been on the stretch for years like On the Route Bicycles, The Peace School, and the Church of Scientology. Seriously. Google street view of 3140 N Lincoln in the middle. But restaurants have had a harder time in general. 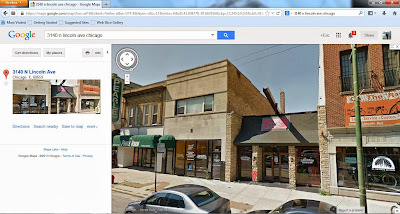 This building at 3140 N Lincoln above had several incarnations. It was sold as a foreclosure for $438,000 in a cash deal early this year and put out of its misery. I have not seen the plans but the new building will most likely be three condo units with ground floor retail. One of our kids attends St. Matthias School in Lincoln Square. We love the community and curriculum. Please attend one of the scheduled admissions coffee sessions to learn more about the school. 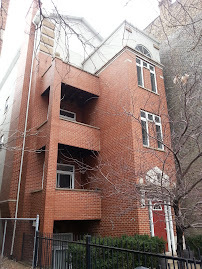 We've had some clients in River North this year for condos and town houses. 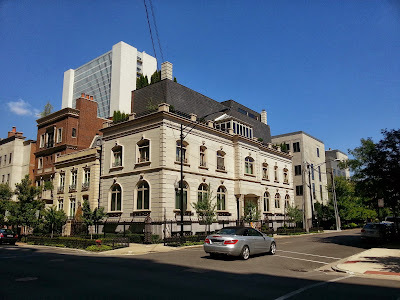 When looking at a town house nearby the Huron and Superior mansions I was asked, "How many houses sell down here". Not many. 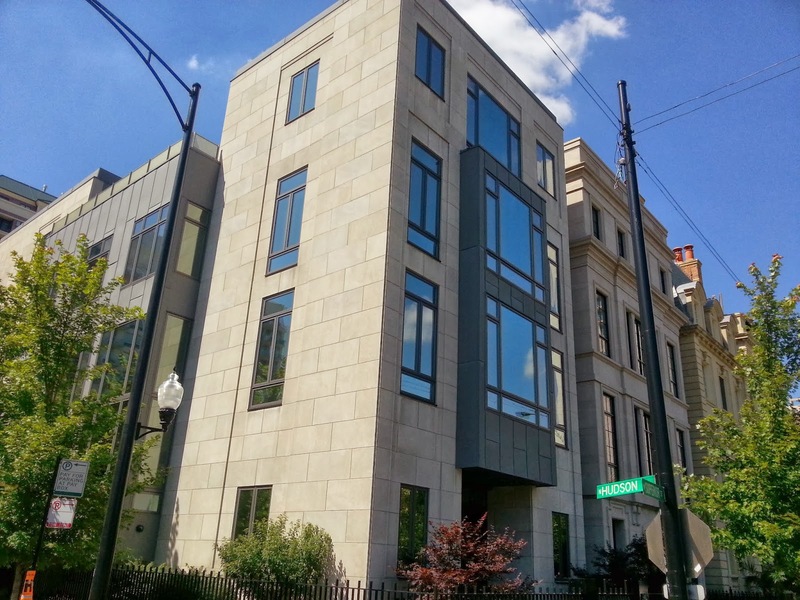 River North is a tony address for the rare single family home owner. The location is steps from popular dining, top services, art galleries and downtown offices. 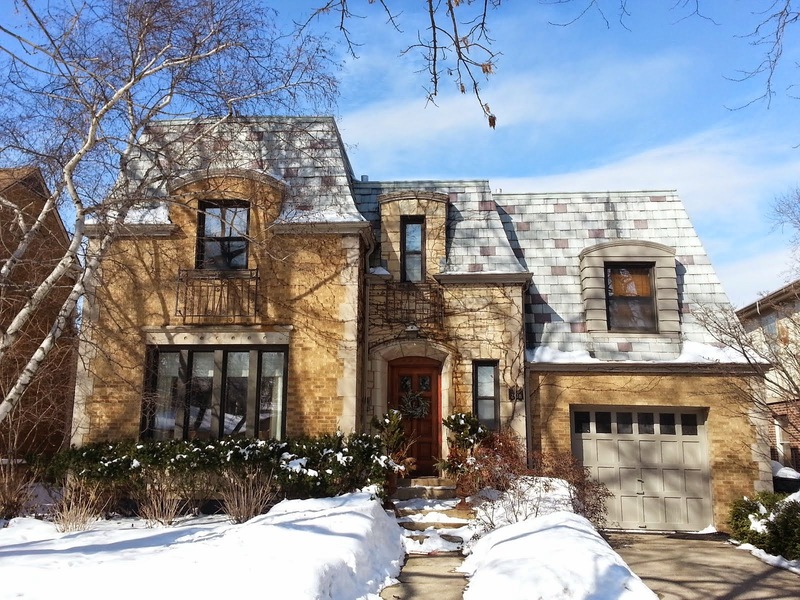 According to our MLS (MREDLLC.com) only one River North single family house has closed this year. 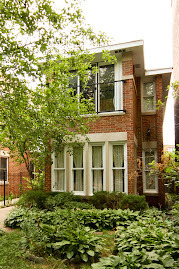 433 W Superior closed as a short sale for $1,600,000. This was a NICE deal for a 2007 build in this location. I did not see this house so it is uncertain what type of condition it was in. For the price it is assumed there was some type of damage but who knows? The house was listed and went under contract in 2 days (according to the MLS listing) within the same small brokerage house. It took 10 months to close even though it was an all cash deal. 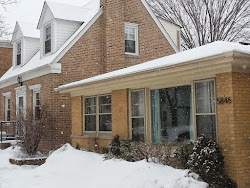 The house was purchased by a long time Chicago developer. 433 W Superior was then re-listed for sale in August for $2,750,000. Only two homes are actively for sale and both on the same block of West Superior. 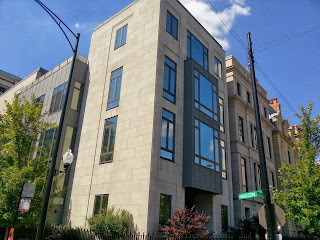 The aforementioned 433 W Superior is listed at $2,750,000 and 469 W Superior is listed at $4,950,000. Three homes are under contract in the same two block radius with asking prices from $2,000,000 to $3,995,000. South Loop has it all... even Chipotle! We were in the western portion of South Loop this morning on an appointment and took a few quick shots. 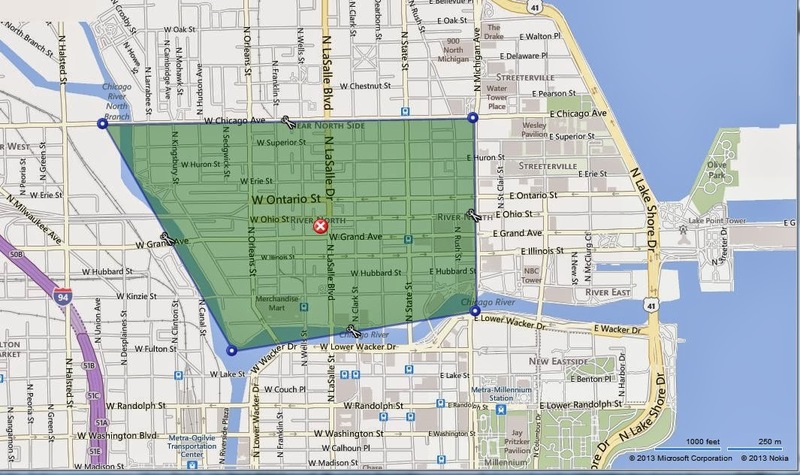 We think a lot of people would be surprised by the ridiculous amount of big and medium box retail chains in the South Loop. Large malls have been built west of the Roosevelt bridge... and stores keep coming. The Roosevelt and Canal intersection is bananas! Kale Realty's flagship office is located at 548 W Roosevelt Road in the middle of this explosion. 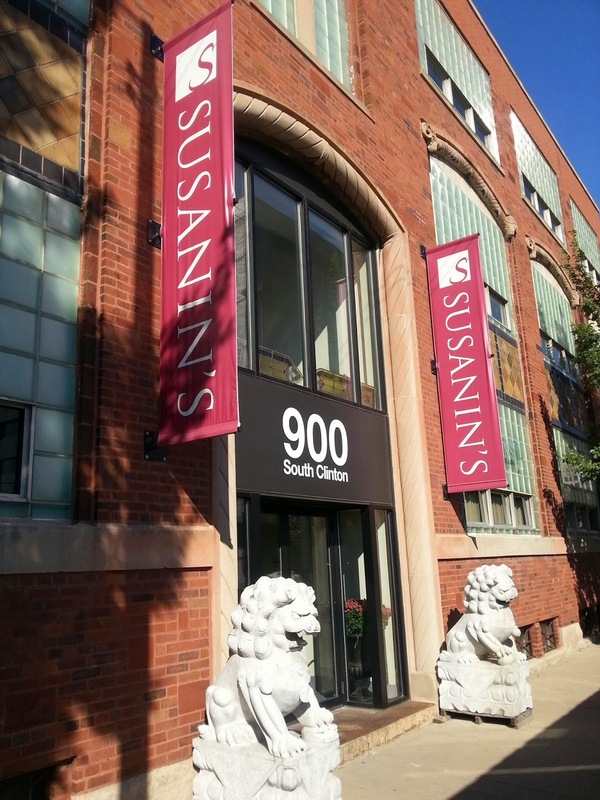 The miles of retail square footage serve the high-rise residents of South Loop nicely. The neighborhood portion east of the Roosevelt bridge features more incorporated retail within the residential buildings and maintains a more residential feel near the lake. We've had a few clients in Logan Square this year. 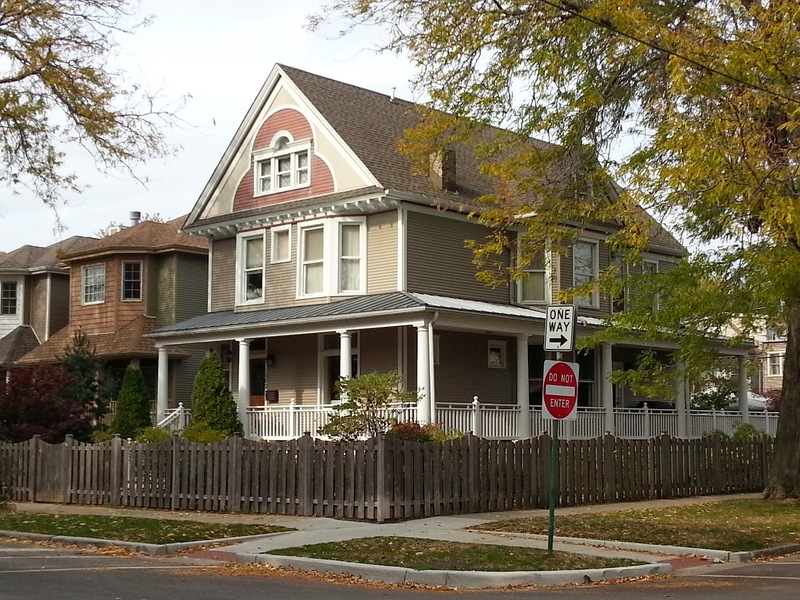 Earlier this week I looked at a potential seller's two-flat near the fantastic Logan Boulevard. 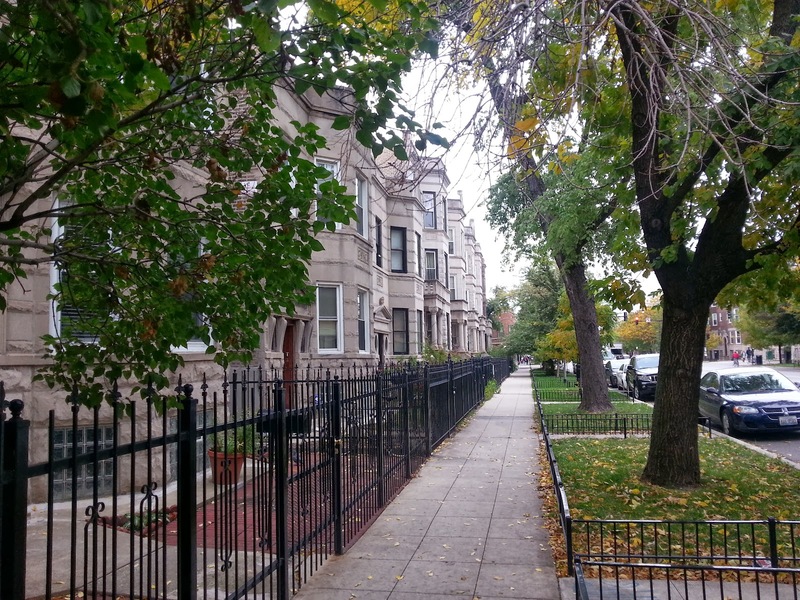 The Logan Square Community Area has been hot for renovations and new construction hitting the market over the past couple years. Developers got back in heavy starting in 2010 buying up many neglected and financially distressed single family homes and small multi-units (two flats, three flats especially). The competition now is crazy for homes with development potential. 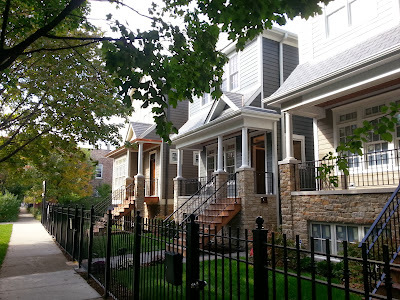 When houses are being built in Chicago we often see a bump in small multi-unit building sales. 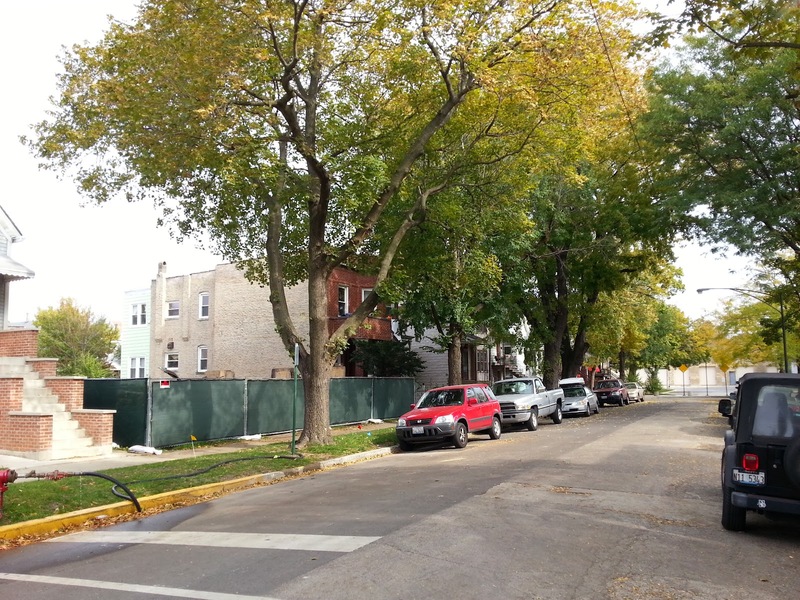 Let's see how Logan Square two-flats, three flats, and four-flats have done in 2013. 163 multi-unit building sales have been recorded in our MLS (MREDLLC.COM) for 2013 thus far. That's up 18% from the 138 multi-units sold over the same period in 2012. The median price for a multi-unit over all this year is about $315,000 - way up from $230,000 last year. 101 two-flat buildings were sold this year in Logan Square thus far with a median price of $250,000. 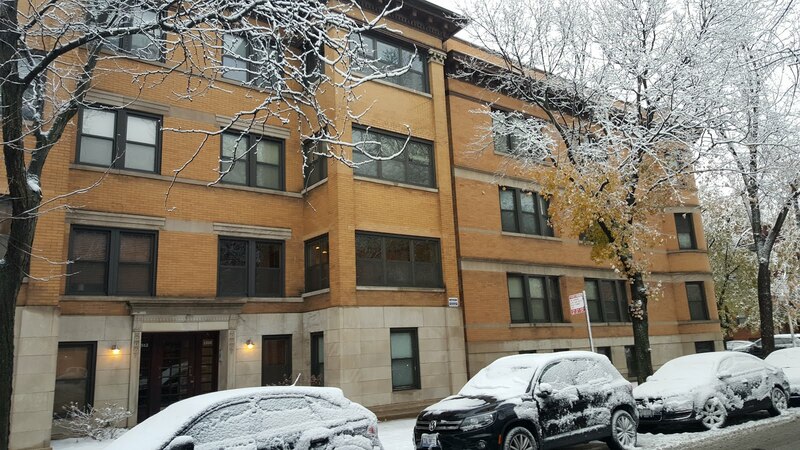 There are 41 two-four flats for sale in Logan Square right now with a median asking price of $385,000. 39 multi-unit buildings are currently under contract with a median asking price of about $265,000. There is over $100,000 difference between median asking prices of buildings for sale and median asking prices of those under contract. Welp, the hip River North days are officially over for our clients who have moved on to a single family house (and kids!). 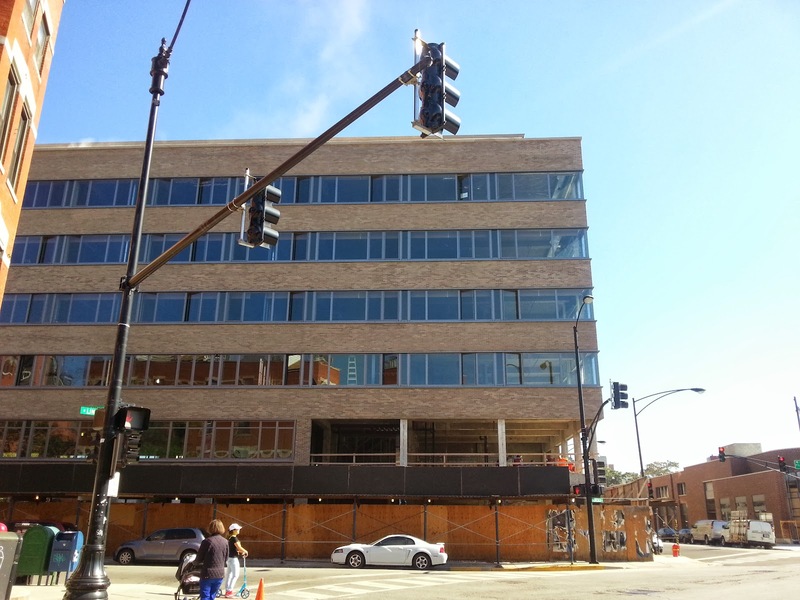 They closed 451 W Huron #511 last week (click link for more photos). The mid-rise one bedroom condo attracted a lot of interest due to its rare 20' x 30' terrace, garage parking and great location. Check out the video tour we did of the unit and surrounding area. The condo sold for $307,500. Congrats to the new buyer and our clients. All parties involved - including the building management - were terrific to work with. 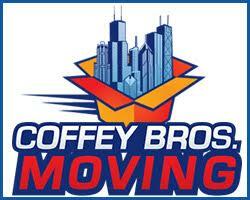 Contact us if you are looking to buy or sell a condo in Chicago from South Loop to Lincoln Square. The foundation has been poured for a new 5 unit condo building at 4545 North Wolcott in Ravenswood. It's rare around Ravenswood and Lincoln Square to see new construction condos being built on interior residential streets. Most new condo developments are on busier retail and commercial streets like North Damen Ave, West Lawrence Ave and North Lincoln. The original frame house was torn down by the property's owner. It was not sold for development rather the home owner is making best use of his property. The old house was similar to the single family home that sits directly to the north shown above. 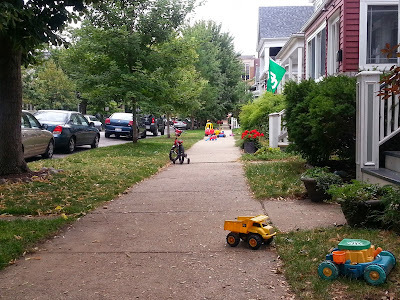 The lot backs up to the elevated Brown Line tracks and sits adjacent to a small town house development to the south. I think a condo building is a good choice for the property given it's proximity to transit, local retail and demand for affordable units (more affordable than single family houses) in this location. These couple blocks of North Wolcott between West Wilson and West Montrose have many multi-unit buildings so it will fit in rather nicely. A new single family house was built and sold on the block this year at 4511 N Wolcott for $720,000 (the train tracks running behind the house kept the price lower than comparable new construction single family homes in the area). Several smaller 1- 2 bedroom resale condos were sold on the 4400 North block for $200-$265 range this year. 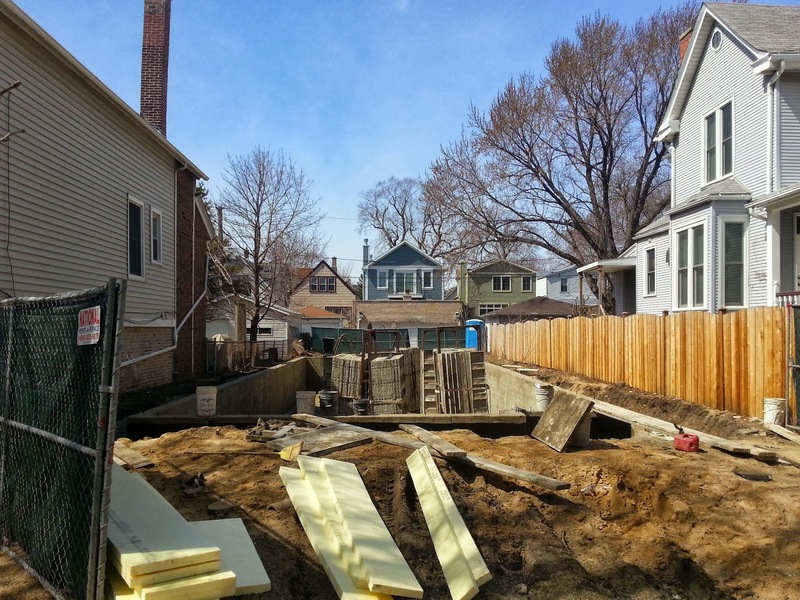 We posted about these Lakeview neighborhood new construction houses on three lots back in April. The homes are completed now and lookin' good on their leafy Burley school district street. 1250 W Barry all the way to the right is under contract at $1,500,000 asking. 1252 W Barry in the middle closed for $1,450,000. These two homes were on standard lots that allowed 3 bedrooms up on the second level and two more bedrooms in the basement level. 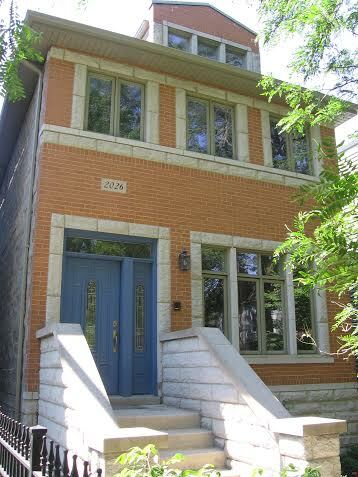 1254 W Barry in Lakeview is for sale at $1,875,000 (photo Eric Rojas, Real Estate Broker). The house is listed with Prudential Rubloff brokerage. 1254 W Barry shown above is currently for sale asking $1,875,000. 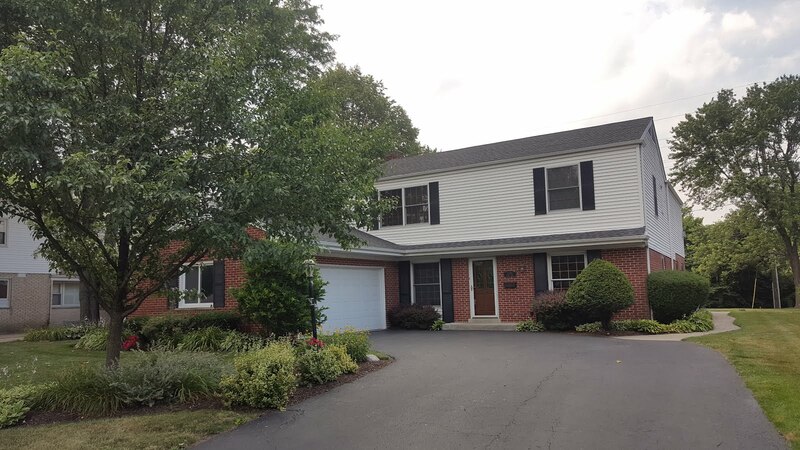 The home is on a wider corner lot (35' wide) allowing for the rare "4 bedrooms up" on the second level. The home's open west exposure lets more light in and feels more spacious without a another property adjacent. A cul du sac is adjacent to the house. It's a unique spot at Lakewood and Barry. Many of our clients buy and sell homes in the Lincoln Square/ Ravenswood/ Bowmanville area around Winnemac Park. 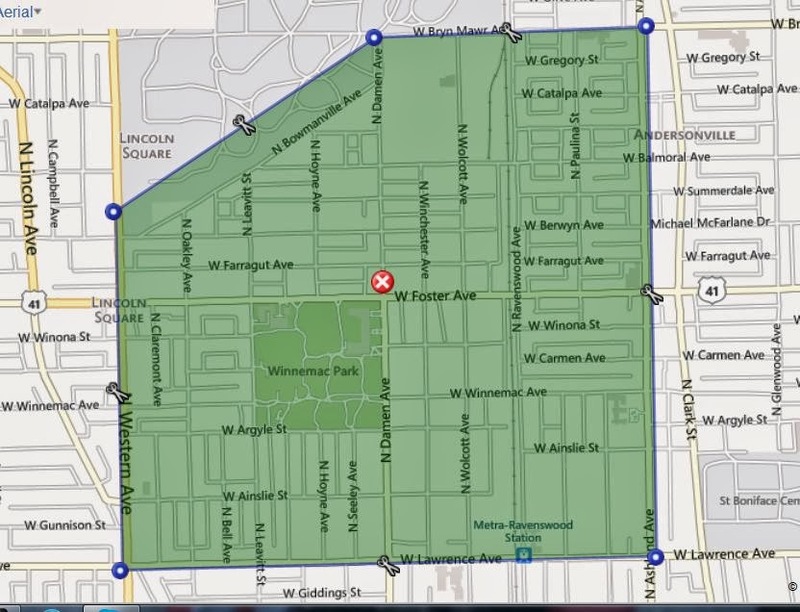 The heaviest local users of Winnemac Park probably live in the boundaries of West Lawrence Ave on the south, West Bryn Mawr Ave on the north, North Ashland Ave on the east and North Western Avenue on the west. 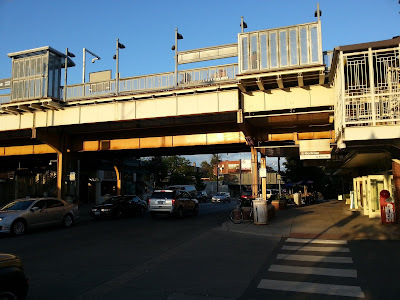 As a home owner in the area I feel this geographic plot definitely forms a common community going to the same schools, churches, grocery stores, CTA stations, Metra etc... and it's easy walking distance to the very popular Winnemac Park. I include Bowmanville north of Foster Ave as they are heavier park users than say residents south of Lawrence that may tend to use Welles Park. 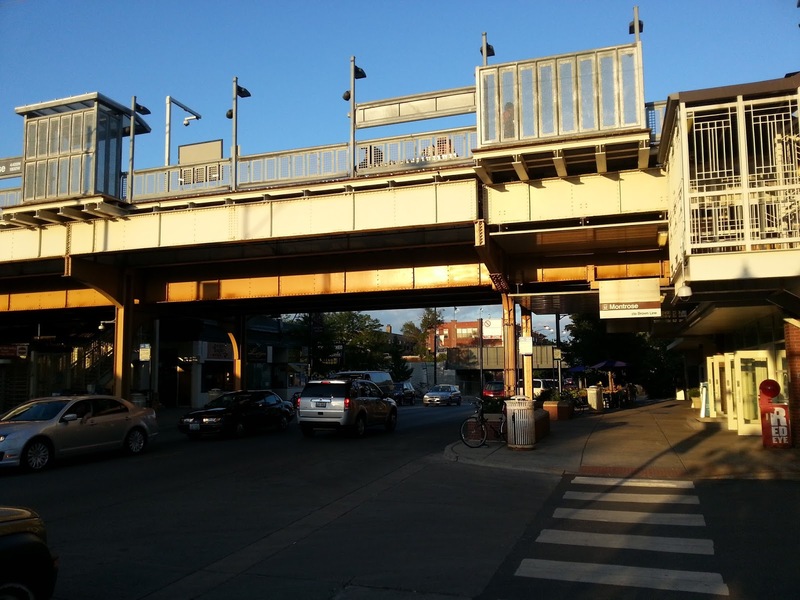 Parts of the Lincoln Square, Uptown and Edgewater Community Areas meet close to Winnemac Park. 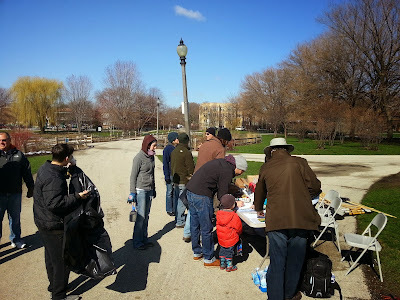 The major streets of Ashland, Lawrence and Western along with Rosehill Cemetery on the north form a distinct area surrounding Winnemac Park. 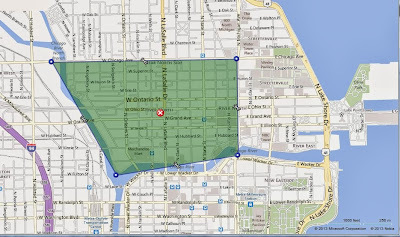 This is a desirable area that has seen real estate prices for condos, houses and land go up over the past couple years. It's an area that really cranked up new residential, commercial and infrastructure development. Here's a look at some real estate sales numbers. 50 houses have closed this year in the mapped area above with a median price of almost $650,000 (up about $165,000 from 2012). Seven of those homes sold over one million dollars. 36 of the 50 homes sold over $500,000. This is ten more houses than sold same period last year. The median in 2012 was about $485,000. 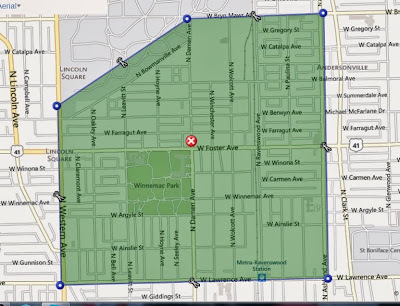 The highest sale in these boundaries is 1650 W Winona. The wide 37.5 lot new construction home closed for $1.5 million. 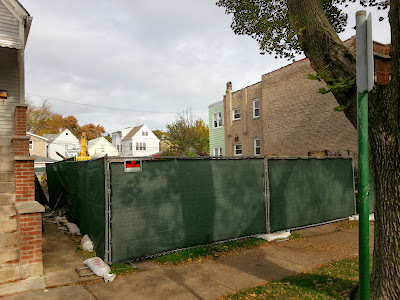 Whole lotta new houses and gut rehabs this year around Winnemac park. 130 condo units sold with a median price of $257,000. 36 of those condos had two bedrooms and two baths with a median price of $295,000. 28 of the attached homes had at least three bedrooms and at least two baths and a median price of about $395,000. In 2012, 123 condo units sold over the same period with a median price of $218,000. 23 of those were two bedrooms, two baths condos with a median price of $270,000. 40 of those sold over the same period last year had at least three bedrooms and at least two baths with a median price of about $368,500. There were more three bedrooms or more units sold last year but prices were lower. This suggests some distressed properties were still being cleared out last year while more expensive and nicer conventional sale homes went on the market this year. 24 "mult-unit" properties with 2 to 4 units sold over the same period with a median price of about $410,000. 14 of those units were two-flats with a median price of about $350,000. Nine of the units were listed as three-flats with a median price of about $450,000. One building was listed as a four-flat and sold for $460,000. 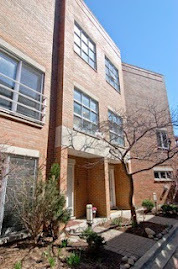 The highest multi-unit sale recorded in the boundaries this year is 5052 N Wolcott. The two-unit building sold for $649,000. 24 multi-unit properties with 2 to 4 units also sold same period in 2012. The median price was lower at $360,000. Statistics are gathered from recorded sales in MREDLLC.com and analyzed, sliced and diced by Eric Rojas, Real Estate Broker at Kale Realty. Streeterville real estate Lock Box H*LL! Few have visited this room and have survived to tell about it. It's Halloween season and I thought I'd share a very scary tale. When showing condos and rentals in Streeterville and other downtown locations it is common to receive keys from the professional door staff. Often, city listing agents are not present for these showings (this is a more common practice in high-rise buildings than in most other North Side city properties where both buyers and listing agents are typically present). 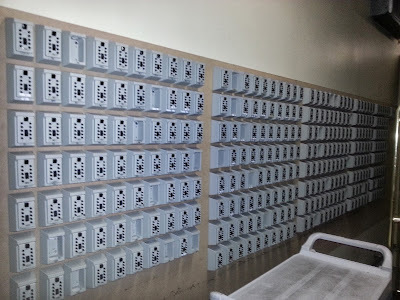 Once-in-a-while you get sent to the "lock box room". The lock box room is jammed with luggage and utility carts. 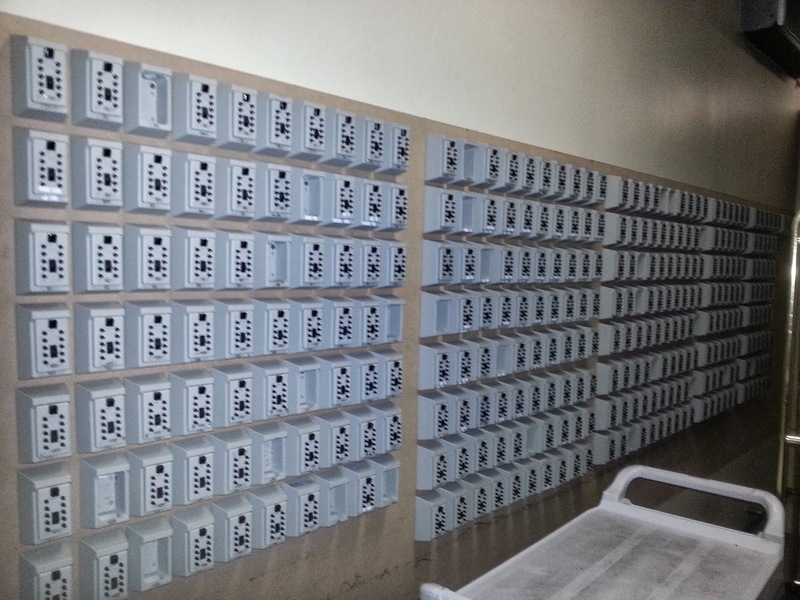 Often, keys are not marked in the lock boxes. You must devise a system to replace them accordingly or be damned by calls from Realtors who don't attend their showings. On this day I was to pick up 4 sets of keys. Often times the lock boxes are jammed because there are too many keys in the box or the Cabo San Lucas key chain with the tequila bottle doesn't fit. Sometimes when you get the keys and arrive at the door the keys don't work. Tragically, many a rookie agent enters the lock box room never to be heard from again. The under $500,000 house is hard to find in Lincoln Square (unless you are going to knock it down). The move-in condition variety is usually located in the further northwestern stretches of the Lincoln Square Community Area (west of Western and north of Foster Ave). 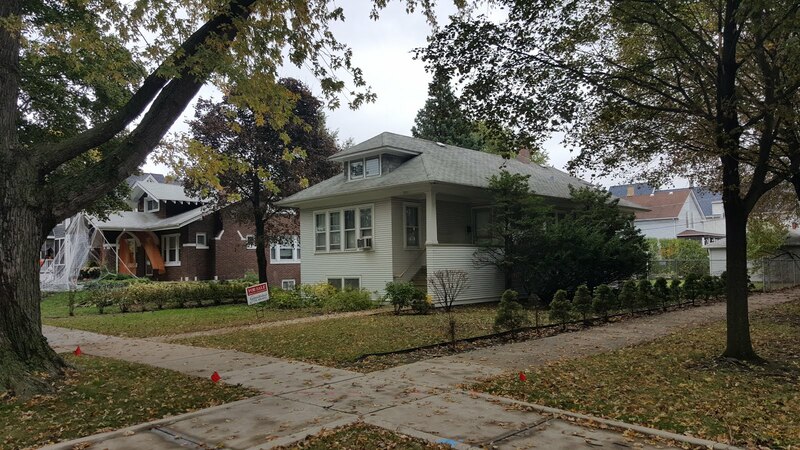 Some quality homes needing little work were found in the Bowmanville sub-neighborhood of Lincoln Square over the past 12 months for under $500,000 but those deals are disappearing. We recently sold 2236 W Carmen Avenue. 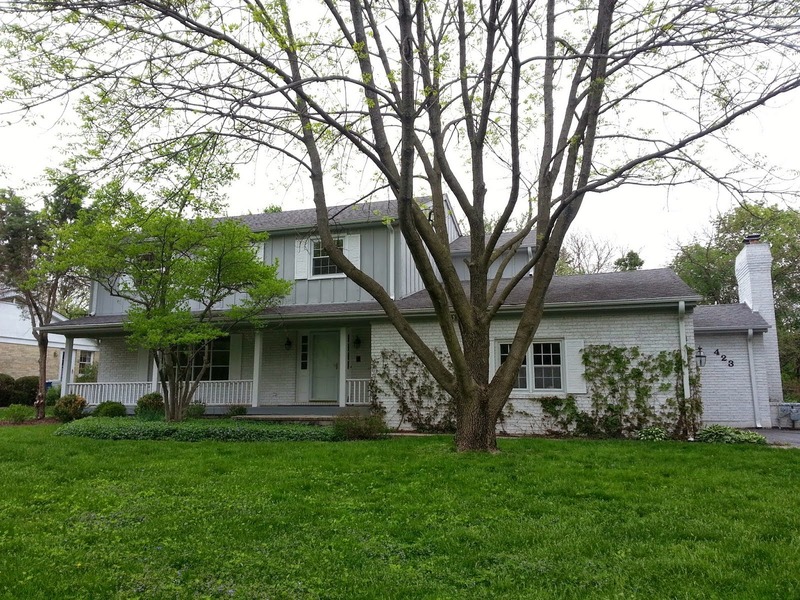 The sellers opted for a low risk, cash offer of $369,000. The property is in planning for redevelopment. 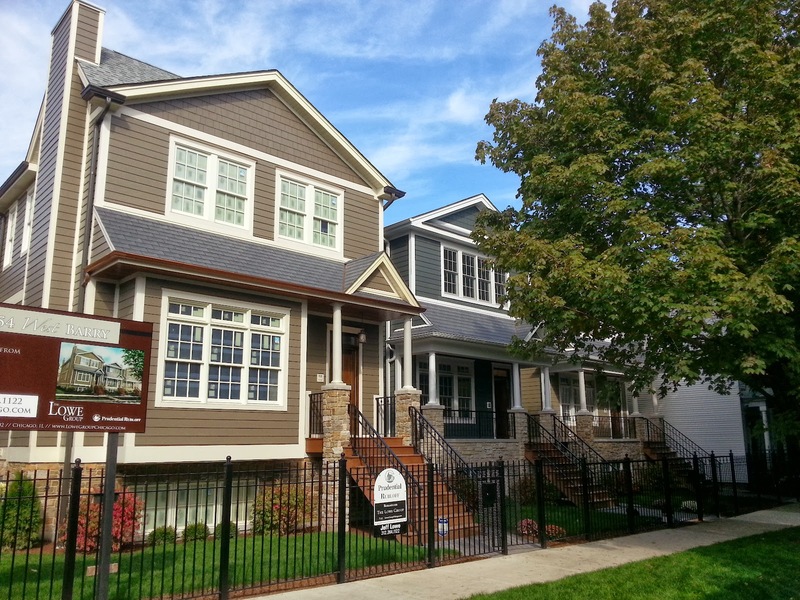 96 total homes have closed in the Lincoln Square Community Area from January 1st through October 4th of this year. 37 of those homes (about 39%) closed for under $500,000. Only 13 of those 37 homes were located west of North Western Avenue. Of those thirteen homes, at least 10 were tear-downs or complete gut rehabs (many of those projects have been completed already). How do I get one of these houses? One strategy buyers must take today is to "over-pay" what local developers are willing to spend on a property for development. Because the average buyer is going to live in the house, they can "afford" to pay a little more and renovate on their time-line (my strategy a few years ago and paid off big). They are not as worried about a profit margin. If a house is truly livable and in a good location home buyers must step-up and be as competitive as possible to secure a house in their desired location. The extra $20K or so (or much more so) will be well worth staying in the city if your commute and quality of life is better than moving outside of it. Obviously, everyone must weigh the costs but the point here you must be seriously aggressive in this current market and structure the best offer possible. Here's a nice post from a local shopping blog on some of her favorite Ravenswood store (in close proximity to transportation). Shop Chicago Chic has a concise run-down on several retail clusters. Signs of a good block! I was walking with Stanley and doing errands in Lincoln Square this morning (minding my own business) when I came across the Fox News truck set up in front of Potbelly. Potbelly went public and crushed it on their IPO. 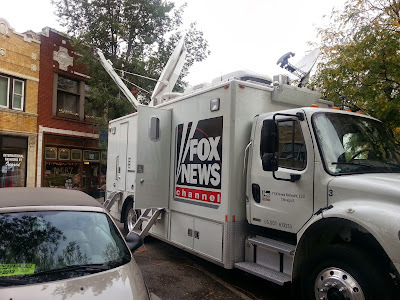 Watch for some local coverage of the stores from news outlets. 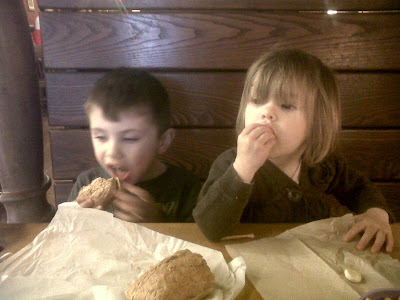 Potbelly Lincoln Square is a very popular spot along the main retail boulevard of shops and eateries. 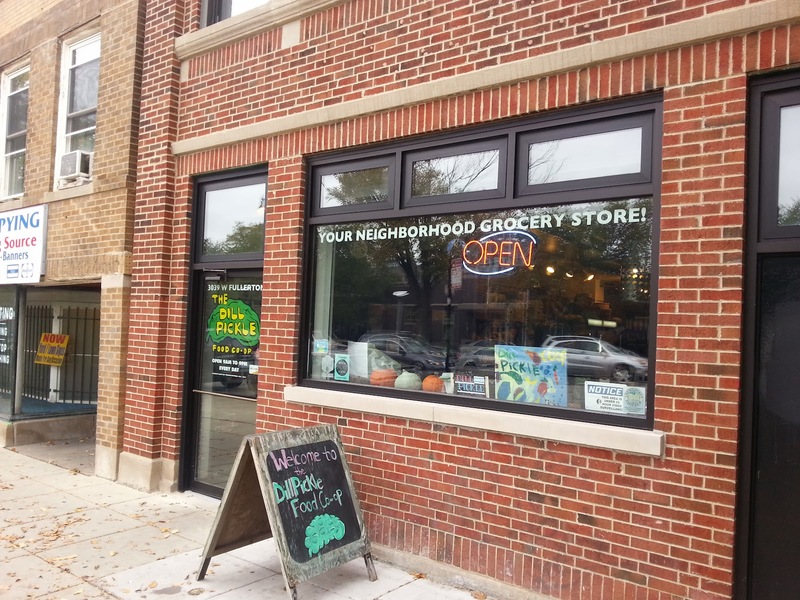 We also use to eat often at the original North Lincoln Avenue store in Lincoln Park across from the former Children's Memorial Hospital site. The downtown Loop stores are always bonkers when I'm grabbing lunch after a closing. Anybody get rich today? You okay with a big public Potbelly in the Square? My business partner Bob has been working with Susanin's for over 15 years. Once housed at Merchandise Mart the company bought a warehouse and opened it's doors at 900 S Clinton of the South Loop 2003. There was nothing around the place at that time. Now, in 10 years time there is just bout every big box retailer imaginable within a few blocks. The new Maxwell development is under construction just a few doors down. The facility is great. We pulled into the parking lot and right up to the docs. It took us minutes to unload a few furniture items set to be included in this December's auction. Bob and I have many solid relationship referrals on hand to meet various needs. He's educated client's on auctions and referred Susanin's on several occasions when they were looking to trim down on personal items during home sales.